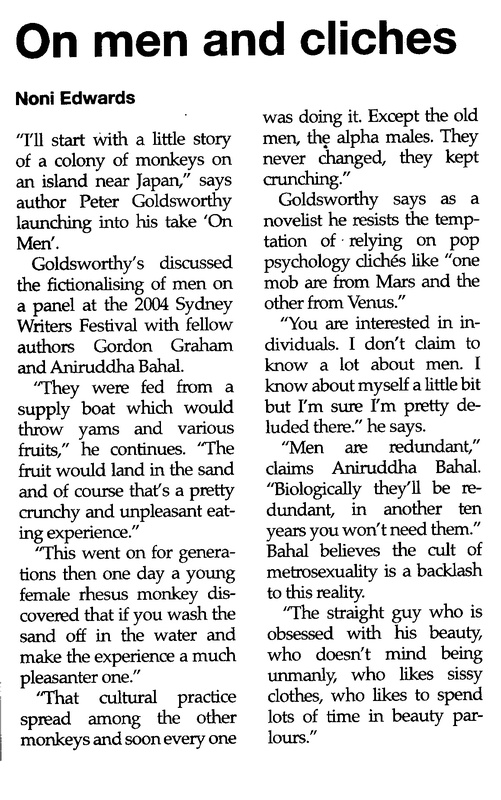 “I’ll start with a little story of a colony of monkeys on an island near Japan,” says author Peter Goldsworthy launching into his take ‘On Men’. “That cultural practice spread among the other monkeys and soon every one was doing it. “You are interested in individuals. I don’t claim to know a lot about men. I know about myself a little bit but I’m sure I’m pretty deluded there.” he says. “Men are redundant,” claims Aniruddha Bahal. “Biologically they’ll be redundant, in another ten years you won’t need them.” Bahal believes the cult of metrosexuality is a backlash to this reality. “It’s contrary to the image of males we’ve had for so long: the macho Clint Eastwood, the John Rambo, the John Wayne – the sturdy oak kind of people who are the way that males have always wanted to be.” Addressing this ideal is the role of authors, says Gordon Graham, author of Top Blokes. This entry was posted in Arts, Australia and tagged culture, gender, literature, men, stereotype. Bookmark the permalink.